What is it: Honda's backchatting the Prius. Highlights: Despite apparent aesthetic inspiration drawn from Toyota's hybrid, the Insight is expected to beat Prius in the price contest. Honda's third-gen IMA hybrid system combines an all-aluminium 1.3-litre petrol four-cylinder with a 10kW electric motor and claims to sip 91RON at approx. 4.4L/100km. Honda brags that Insight could get up to 600km from a single tank. Insight is already in high demand - the first batch of domestic orders was double its initial monthly sales targets. Australia-bound: Honda hopes for a late 2009 release, but it might spill over into 2010. The world's most affordable hybrid, the Honda Insight, will be the main attraction at the 2009 Melbourne Motor Show from 27 February to 9 March. Mr. Fumihiko Ike, Chief Operating Officer of Regional Operations for Honda Asia Oceania announced the Insight's arrival at his recent visit to Australia to launch the all-new Honda City. Honda Australia's Senior Director, Mr. Lindsay Smalley is looking forward to the Insight being available in Australia in the near future. "After pioneering hybrid motoring in Australia with the original Insight in 2000 and following this with two generations of Civic Hybrid, we are looking forward to showcasing our latest innovation in hybrid technology with the second generation Insight. "This is one part of our vision to offer more hybrid motoring options to the Australian public," Mr. Smalley said. 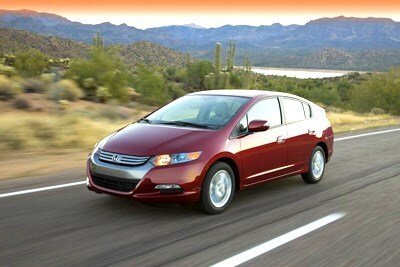 The all-new Insight hybrid vehicle is currently on sale in the United States and Japan. The new Honda Insight has been designed to offer a practical, five-seat family car at an affordable price, with excellent fuel economy and low CO2 and other emissions. The Insight has a boot capacity of 408 litres with the seats up. The repackaging of the IPU and batteries means the Insight has seats which fold almost flat, increasing the boot capacity to approximately 1,017 litres. Honda's latest hybrid vehicle revives the Insight nameplate, which was first used in 2000 and marked the introduction of hybrid motoring to Australians. It also marks a return for Honda to producing hybrids in a dedicated aerodynamic body, designed to optimise the performance of the efficient petrol-electric hybrid drivetrain. The Insight combines an optimised 1.3 litre i-VTEC engine, now with Vehicle Cylinder Management (VCM) which shuts down cylinders and in some cases all four cylinders, to reduce fuel and emissions. It has a compact thin electric motor that gives the engine assistance when increased performance is required and acts as a generator during deceleration and braking. It also allows electric only operation in some slow and medium speed conditions. The Insight has been designed to give good real world emission and fuel economy figures. Its key element is the Eco Assist system that is fitted as standard. The upper instrument cluster where the speedometer is situated features a colour changing ambient light that illuminates green when driving ecologically, blue/green when the car is being driven acceptably and blue when driving with less regard for economy. The ambient lighting of the speedometer combines with a bar diagram which is more than a simple instantaneous economy meter. The display in the centre of the rev counter shows how aggressively the driver is accelerating or braking and encourages the driver to stay towards the middle with lighter more progressive use of the brake and accelerator pedals. To chart progress during each journey, leaves will appear on the bare stems of the plant icons on the centre meter if the driver is matching the ecological driving conditions ideal. Should their driving go outside of these parameters for a length of time, the plants will wilt. At the end of each journey the driver is given a score which they can build up over time and gradually they will be rewarded with trophy symbols for continued good driving. The practical interior is complimented by an attractively styled and aerodynamically profiled body, (similar in looks to the FCX Clarity fuel-cell car), which achieves an excellent CD of 0.28, helping the Insight to achieve excellent fuel economy and low emissions.